Armenians are known in Georgian language as ‘Somekhi’ and the country Armenia is called ‘Somkheti’. In medieval Georgian Chronicles the region populated by Armenians was known as Somkhiti სომხითი, a geographic term referring to Armenia. In the 18th century, “Somkhiti” was largely replaced with “Somkheti” (სომხეთი) as a Georgian exonym for Armenia. The term “Somkhiti”/”Somkheti” is presumed by modern scholars to have been derived from “Sukhmi” or “Sokhmi”, the name of an ancient land located along the upper Euphrates. According to Professor David Marshall Lang, The name ‘Sokhmi’,[…] applied to tribes living along the upper Euphrates, seems to be perpetuated in the medieval and modern Georgian texts as a name for the Armenians in general — ‘Somekhi’, meaning ‘an Armenian’ and ‘Somkheti’ for ‘Armenia’. It’s asserted to be a Georgian variation of the word ‘Meskhi’ from the Mushki people, one of proto-Armenian tribes populating the Armenian Highlands (as described by Diakonoff). According to Professor James R. Russell of Harvard University, the Georgian designation for Armenians ‘Somekhi’, preserves the old name of the Mushki. Pliny in the 1st century AD mentions the Moscheni in southern Armenia (“Armenia” at the time stretching south and west to the Mediterranean, bordering on Cappadocia). 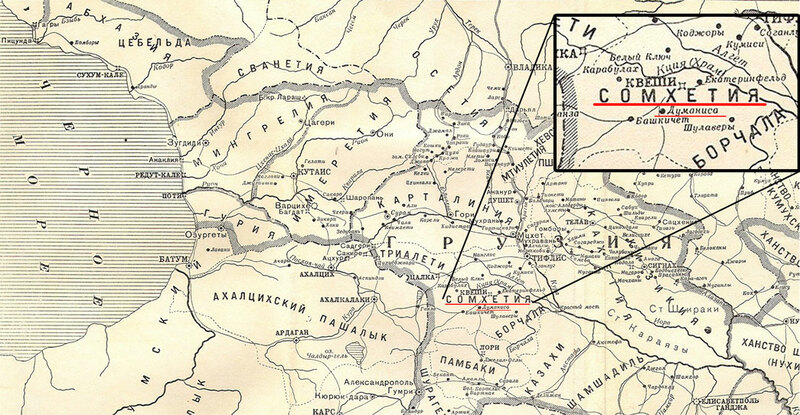 The following map printed in Tiflis (old Tbilisi, Georgian capital) in 1902, shows the region that to Georgians was known as Armenia (Somkheti, Сомхетия in Russian), encompassing the historic settlement Dmanisi (in the map shown as Думаниса in Russian). The lands populated by Armenians.